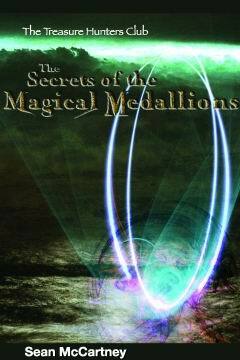 The Secrets of the Magical Medallions is book one in The Treasure Hunters Club series. The story sets off with a tale from the past between two rival religious sects, one being the Dorcha, those of the dark and the Leois, those of the light and the medallions that the two groups are warring over. One group wishes to possess them both and bring destruction to the world and the other group work to keep the two apart. Thirteen year old Tommy Reed is the "leader" of the Treasure Hunters Club whose members consist of his three closest friends, Jackson Miller, Chris Henderson and Shannon McDougal. Together they research artifacts and go on make-believe treasure hunting excursions, well, they did find that old Tab can, and wait for news from Tommy's famous treasure seeking uncle, Diamond Jack Reed. Diamond Jack has landed the job of all jobs, with this one he feels he'll be able to retire and live the rest of his life in extreme comfort. Jack has lost his "edge", the one that drove him to find the impossible, now, he just wants the money and get out, however, after being commissioned by some unsavory sorts of men, Jack compromises all those he loves and puts all their lives in danger. Jack is hired to find a medallion and after finding several at the bottom of the ocean, he sends the fakes to his nephew and hands over the real gem to Manuel de la Ernesto, a collector of rare artifacts. Tommy and his friends are thrilled to receive their latest treasure and begin to research its origins and that's when things begin to go awry. The FBI show up and wish to question Tommy and his friends and between all their secret hideouts and traps, the young group of friends always manage to stay one step ahead. When strange things begin to happen to Tommy whenever he makes a wish while in possession of the medallion, the group soon realize there may be more at stake here than meets the eye. Desperately wishing Diamond Jack were there to help the group, they realize they are on their own and work against the net that is encapsulating them and without any information whatsoever to go on, they hope they will be in time. I found The Secrets of the Magical Medallions to contain an over-abundant and overuse of dialogue, without much detail to character inflection filler. Quite often the conversations went between the three groups, Tommy and his friends, Jack and his group and Ernesto and his cronies, without any direction that it had occurred. I found myself stopping to reread the paragraph for I hadn't realized we switched scenes. I also found the villians to be wooden and stiff and their direction sometimes seemed aimless. I would've loved to have more background information on the medallions, I felt the author could have given the reader more detail and history without disrupting his writing technique. As well, more character building information could have been shared. I did like the group of children, they each had their own distinct personality trait and it was clearly read this way, but, other than Tommy, I didn't really feel like I knew them. I also liked the representation of Tommy's parents, the author had their depression summed up and their antagonistic views were well placed. For young readers, I'm quite positive they will enjoy this book, its fast paced enough and not bogged down by facts and filler and would give the average person a very enjoyable read. However, if you like a little more oomph in your books then this will not be for you. A Treasure Hunting Legend... Four Ordinary Kids... Two Magical Medallions... Pursued By An Ancient Evil... In One Extraordinary Adventure. Join the Treasure Hunters Club as they look to unlock the Secrets of the Magical Medallions. ...Some Secrets Are Better Left Alone. When Tommy Reed received a medallion from his famous treasure hunting uncle "Diamond" Jack Reed he didn't think much of it. Now an ancient evil is pursuing his every move and his treasure hunting club friends are on the run. They must unlock the secret to the medallion before evil can hunt them down.